By providing a free and unbiased platform for the publication of peer reviewed scientific findings around the science of disease reversal and prevention, the IJDRP is seeding a new paradigm in healthcare. The International Journal of Disease Reversal and Prevention (IJDRP) has published its highly anticipated first issue, containing ground breaking research from some of the most respected physicians in the world including Drs. Neal Barnard, Caldwell Esselstyn, Jr. and Joel Fuhrman. 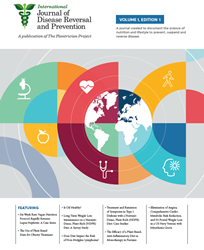 The inaugural issue presents evidence that nutrient-rich diets consisting predominantly of whole plant foods, paired with other lifestyle changes, may be capable of decreasing Type 1 diabetes antibodies and improving glycemic control; reversing Type 2 diabetes, lupus nephritis and cardiovascular disease, and are also effective in treating obesity and psoriasis. In addition, such diets are powerful tools in managing long-term weight loss. The research contained in this and future issues of the IJDRP present a bright path forward out of what could be a bleak future for many. According to the U.S. Center for Disease Control, six out of every ten people in the U.S alone suffer from at least one chronic illness. At the same time, chronic diseases such as heart disease, cancer and diabetes are not only the leading causes of death and disability but also the leading factor in the nation’s $3.3 trillion in healthcare costs. With similar grim statistics being cited across the globe, it is clear the current practice of managing chronic diseases is neither successful nor sustainable. A new approach is needed urgently. Also published is the first issue of the Disease Reversal and Prevention Digest, a companion publication to the IJDRP. The Digest is a carefully curated digital magazine that includes print interviews from Journal authors sharing the potential implications of their research in their own words in easy to understand language, as well as articles from renowned medical professionals pertaining to plant-based eating, health, wellness and other human-interest topics. For a limited time, readers may purchase an annual subscription for just $9.99, a 67% savings off the annual subscription price of $29.99! The International Journal of Disease Reversal and Prevention, and The Disease Reversal and Prevention Digest are special projects of The Plantrician Project and made possible with initial seed funding and support provided by the Purjes Foundation. The Plantrician Project is a 501c3 not-for-profit corporation dedicated to providing educational events, tools and resources for healthcare practitioners and those they serve. For more information, visit http://www.plantricianproject.org.